This family course programme is specifically designed to fit the lifestyle and requirements of each individual family. Fun and flexible, our Family Courses can be tailor-made to create the perfect experience for your family holiday. All English lessons are held at the same time and in the same building – perfect for families with young children or teenagers. 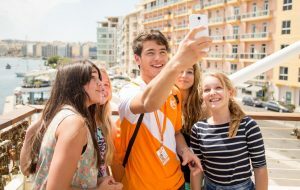 For parents (aged 18+) – Parents may choose accommodation only or choose a Business English, One-to-One Course or even an Extreme Adventure Course instead of the standard General English Course. For children (aged 2-7) – Families travelling with young children are advised to book our Playschool. Available to children between 2 and 7 years of age, our Playschool offers parents the unique opportunity to undertake an English Course while their children are supervised by professionals. The Playschool and Kids’ English Club sessions are held between 09:00 and 12:30. The children are also supervised during the daily half-hour break. For children (aged 5-8) – Kids’ English Club is held all year round and is designed to introduce young children between the ages of 5 and 8 to the English language in an fun, informal way. Games, song, music, crafts and water-based play are among the activities that take place in our Kids’ English Club. There are no written or grammar lessons. For children (aged 8-17) – Children can book Junior or Teen English courses or one of our combined English + Activity courses: Junior Activity English, Teen Vacation English, Junior / Teen English Sport or Teen Vacation English Gold. Our Accommodation Department will offer your family full support and assistance in booking the right type of accommodation for your family holiday. Families can choose from our wide range of accommodationwhich includes host family stays, holiday complexes with pools and hotels or self-catering apartments with sea views. Families travelling with children under the age of 12 are offered a 50% discount at most hotels. All the accommodation is situated within 30 minutes of the school for the ease and convenience of our students. View more accommodation details. No family holiday is complete without tours, excursions and activities. The Excursion Department at Alpha School of English offers a daily activity programme to students of all ages. In addition to this, families may select one of our Family Activity packs, which offer a range of excursions and activities to ensure you have an unforgettable family holiday in Malta. Parents who wish to accompany their children on their school excursions are advised to book one of Vacation English activity packs. Adults 18+ and children from 2 y.o.